Looking down from Red Cross hill at a two-story red brick building. There, north of the Plaza, or below in this photo, is an interesting L-shaped building. The red- brick building in the bottom right corner is this entries’ subject, Each of its many doors opening to the street must have had stories, history, take place within. The rock outcropping in the photo’s foreground can be clearly seen from town. 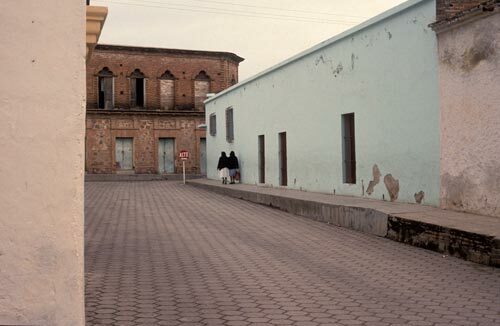 Walking from a barrio to central Alamos for any of a variety of reasons. 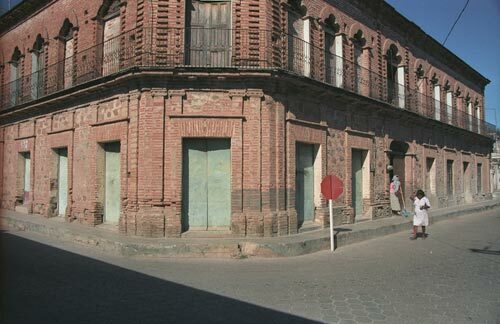 Here, a Calle Antonio Rosales runs into a building. These two women are only a block away from the Mercado and the Alameda. They most likely are out walking about doing their daily food shopping. 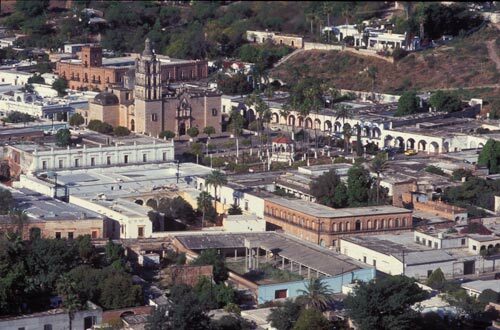 On the other foot, they could be going to the bus station, or visiting a doctor or dentist, doing errands, visiting friends, picking up repairs, or shopping in various stores, stalls and carts comprising the business, retail and service center of Alamos. The woman on the right is carrying a large bag, a good clue shopping will be included on this walk. 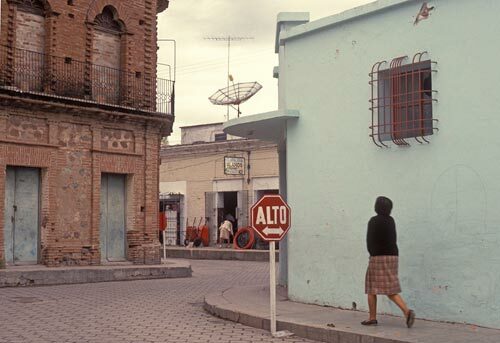 Calle Gral Antonio Rosales jogs across Calle Mariano Matamoros. It is a wonderful day to be out walking and visiting on Calle Rosales. An old woman with walking stick, dressed in grey, baby blue and pink, stands at the red brick building’s entrance as another woman walks by in the street headed east. One would think all the shuttered doors, so near the Alameda, once had vendors inside. 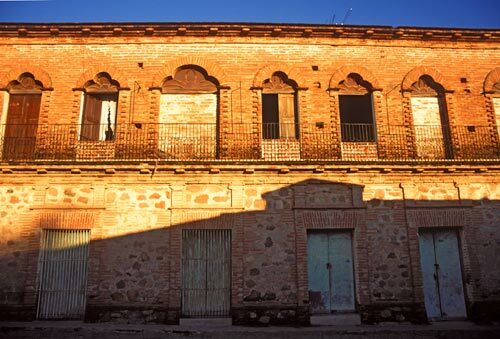 This does not look like a typical residence, it being without a single window treatment at street level and also one of the few two story structure in Alamos, Sonora, Mexico. The architectural shadow of one building cast upon a sun blazoned building. Early morning sunlight music plays on the moorish details of this building which are similar in spirt to the municipal government building, the Palacio, also made of red brick. 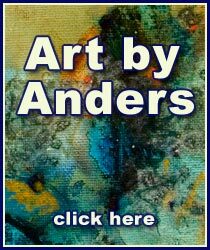 History is here to be comprehended as one looks at textures and patterns of the old buildings. Think back to the day when the stones and bricks were being laid in place. Pause, look and listen. 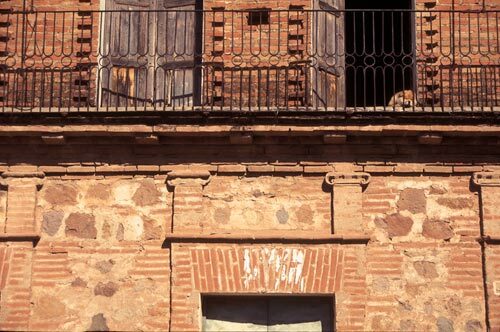 What a wonderful vantage point for a dog to take a morning siesta. A resident of the red-brick building rests in the warm sun. At this time, 1996, the owners of the town’s printing shop, which had a sign I remember as ” Impresta F. Hernandez, Sucn,” managed by Elena del Carmen, lived here. The printing shop was working with letter presses that could have been over a hundred years old. The shop was planing to purchase a computer and move into the digital era. History is forever changing for history is the record of change. The Municipal Palacio and the brick building look as if they are related. We return to the northeastern hill overlooking Centro Alamos. 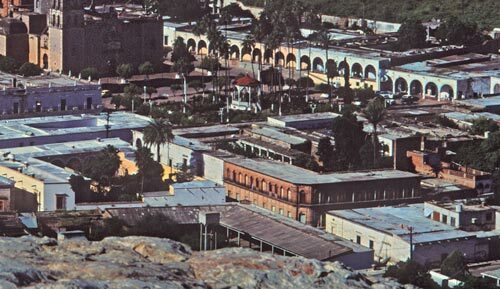 From here the Palacio, in the upper left-hand corner, and this two story brick building, which resembles a mercado from another day, in the bottom right-hand corner, bookend the plaza and church.